"This can be made with guava, apricot or pineapple and all will be delicious. I usually serve this with rice." To Marinate: In a large resealable plastic bag combine the fruit nectar, soy sauce, vinegar, ginger root, ground ginger and brown sugar. Mix together until sugar dissolves. Add pork, seal bag and refrigerate for at least 3 hours or, if possible, overnight. 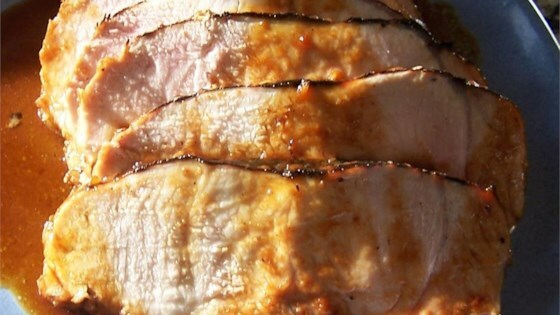 Fresh rosemary and garlic salt are the keys to a super-simple pork roast. I marinated overnight, it was pretty good, think I'd like more "zest" but it was a great change on pork, this is a keeper! absolutely awesome. couldn't find guava so used pink grapefruit juice and marinated 2 1/2 days. added cornstarch for awesome sauce. thank you. I followed the recipe exactly (perhaps I was a bit liberal with the thickness of the sliced ginger root) and it was delicious! My husband loved it and I will be making it again soon. Thank you! I and the wife liked it. Kids thought it was OK. I think ginger is a bit of an acquired taste.